1. Whisk the eggs, milk, crème fraîche and 3 tbsp Parmigiano Reggiano with a fork then season. In a large non-stick saucepan heat the mixture for 4–5 minutes, stirring occasionally until scrambled to your liking. 2. Meanwhile, toast the bread and spread with the pesto. 3. 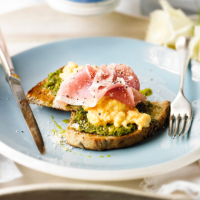 Place 2 slices of toast on each of the 4 plates, overlapping slightly, spoon on the scrambled eggs, top with the Parma ham and sprinkle with remaining Parmigiano Reggiano and some black pepper. Try using sun-dried tomato paste and grated Gruyère cheese instead for a different taste.